What fire retardant measures can be taken? Fire barriers i.e. THATCH-SAFE® or SuperLux can be installed under the thatch. The thatch can be treated with Fire retardant sprays such as Magma Firestop. Chimney heat monitors such as the Chimney Temperature Monitor can be installed. 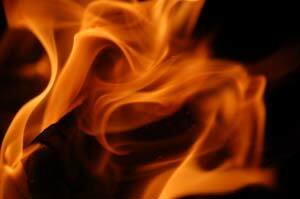 Do Fire retardants affect the roof? Phosphate based products like Magma Firestop do not have a negative effect on the thatch. Can I have real fires? Yes real fires are fine. Ideally the chimney height should be well above the highest point of the thatch, Chimneys should be well maintained and clean. 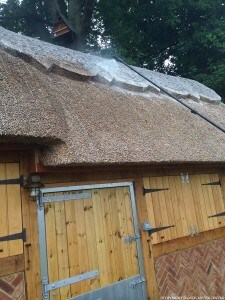 Yes, but not fire proofed, the material can either be sprayed on completion of the thatch.